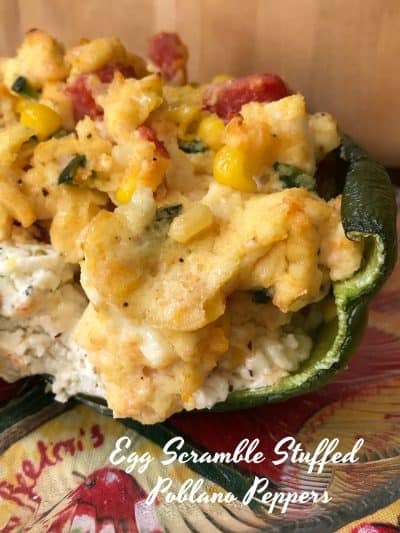 Egg Scramble Stuffed Poblano Peppers are super delicious. This recipe came about one day when I went into the kitchen, wanted to make something fast, easy and different for lunch. This past weekend I stopped at my local farm stand and picked up a nice selection of fresh vegetables ranging from cauliflower, eggplant, kabocha squash and poblano peppers. I eyed up the poblano peppers and got to thinking. 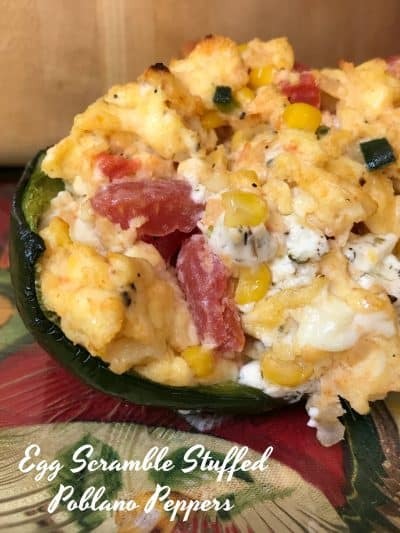 This recipe has an array of ingredients such as; fresh sweet corn, onions, chopped tomato, diced poblano peppers, eggs, and garlic & herb goat cheese which came together beautifully in this recipe. Poblano peppers have a sharp spiciness when fresh but when roasted or baked, the flavor mellows considerably. The goat cheese in this recipe adds a delicious tang which goes really well with the heat from the peppers. Poblano Chile [poh-BLAH-noh] A dark, sometime black green chile with a rich flavor that varies from mild to snappy. The darkest poblanos have the richest flavor. This chile is about 2 1/2 to 3 inches wide and 4 to 5 inches long, tapering from top to bottom in a triangular shape. The very best poblanos are found in central Mexico, though they are now grown in the U.S., Southwest area and in home gardens throughout the U.S.
Fresh poblanos can be found in Latin food markets and in many supermarkets. Their peak season is summer into fall. They’re also available canned. Ripe poblanos turn a reddish-brown color and are sweeter than the green. In their dried state they’re known as Ancho of Mulato chilies. Poblanos can be used in a variety of dishes but are best known as the chile of choice for Chiles Rellenos. We love goat cheese here on Turnips 2 Tangerines and our favorite brand is Montchevre Goat Cheese We’ve used this brand in most of our goat cheese recipes. Today we wanted to share just a few of our favorites and they are: Pear Bacon Honey Goat Cheese Crostini, Goat Cheese Stuffed Mini Peppers, and Sweet Potato Goat Cheese Cranberry Rounds. Looking for something different to serve for breakfast, lunch or dinner? Then give this fast, easy and delicious recipe a try. Slice stem end off of poblano pepper and remove, along with seeds. Cut a 'v' slice down the front of the poblano pepper. Remove 'v' section and dice. There should be about one tablespoon of diced peppers. Set diced peppers aside. 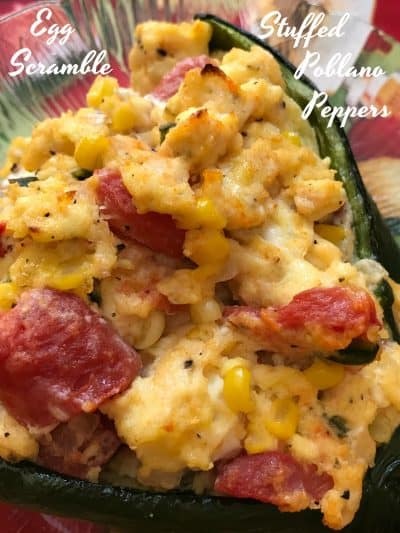 Place poblano pepper in a small baking dish, drizzle with 1 tablespoon oil. Bake for 20 minutes. In a small bowl, whisk together eggs, milk, salt and pepper. Set aside. Meanwhile, in a medium saute' pan, over medium heat, heat remaining 1 tablespoon oil. Add diced onions and poblano peppers. Saute' 1 to 2 minutes. Add corn, saute' for an additional minute. Add chopped tomatoes and saute' for one minute. Melt one tablespoon butter in same saute' pan. Add egg mixture. 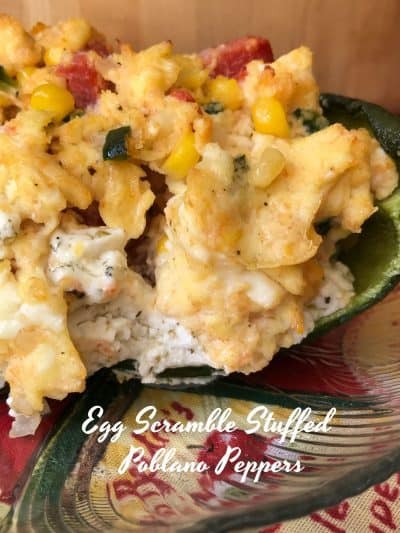 Scramble eggs with veggies until eggs are set, yet soft. Stir in crumbled goat cheese, remove from heat and set aside. Remove pepper from oven. Carefully stuff scrambled egg mixture into poblano pepper. Bake for 10 to 20 minutes. Serve.